Legends of Equestria attending GalaCon and BUCK! Legends of Equestria will be attending the European conventions GalaCon and BUCK! In addition to presenting panels, we'll be giving convention attendees an opportunity to play the game in its current pre-alpha state. Convention-specific quests within the game will be available to those who attend. Stop by if you feel like playing Legends of Equestria! Hello everyone! I hope you all had a great time with the open server weekend! Repeat step 4-5 until step 4 doesn't have anything negative to report anymore. 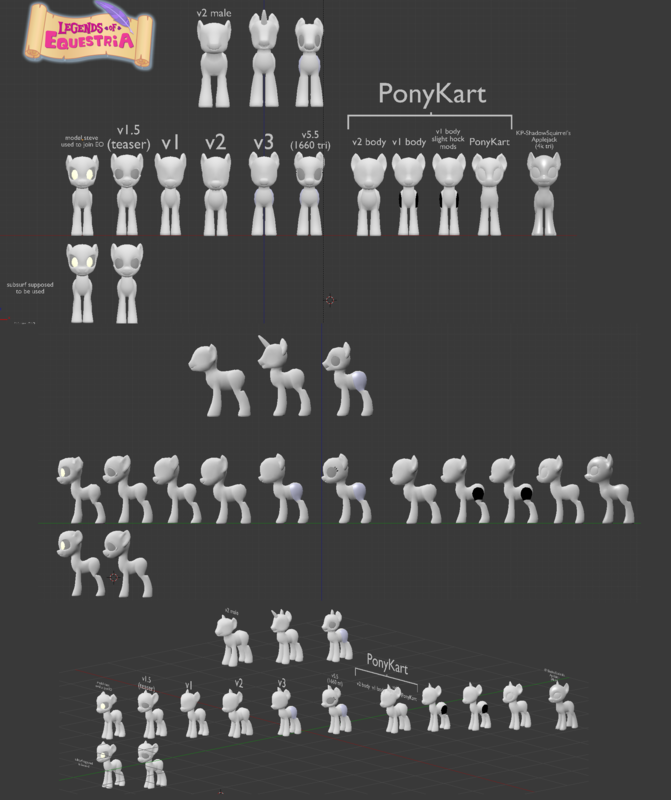 Let's look at the development of the pony models so far. First, here's the front part of the pony! As the model evolves, the face becomes more and more rounded and ears begin to perk up more. The muzzle also becomes more well-defined with the newer versions. SteveLynx's work on the muzzle and the ears can be seen much more clearly in profile view. We also notice that the shape of the body has changed. The first 3 models have a very arched back and the fourth doesn't arch at all. The most recent model comes with a nice balance between the two! Lastly, let's look at a 3/4 view. Here we can see the development of the head itself. The first few models have a very large, flat forehead and as the models progress we see that the head becomes more rounded. SteveLynx has done some amazing work on these models, and he deserves loads of praise. He plans to continue his 3D modeling work with Legends of Equestria and aspires to one day make a perfect 3D pony model that can be used by everyone. If you ever see SteveLynx on the forums, don't forget to tell him that he's awesome! Writing Auditions Round Two Begin Now! 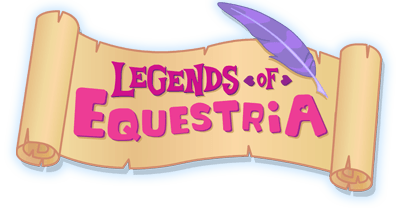 Thank you to all of our writers who applied to help make Legends of Equestria a reality! We're moving into the second round of writing auditions right now, so make sure to check your inbox if you've applied. This also means that we won't be taking submissions for the writing team from any new applicants as of today, but the other departments listed in the hiring announcement are still seeking help, so be sure to let them know if you think you've got what it takes. Congratulations to our finalists, and good luck in the second round! We're extending our Open Server Weekend! Our servers are now closed! Thanks for playing, everyone! Exciting news everyone! We have decided to extend the stress test a day further! The ending time of the test is now Monday at 11:59 pm PDT. We would also like to announce that your account will be manually activated within a couple of hours of registering on the site. This should activate your game account as well. Since our emails cannot be received at a reliable rate due to the email restrictions, we request that you try the servers a few hours after registration, even without receiving a confirmation email. Thank you all for sticking with us during these complications. Getting the game, fun stuff to do, and commands! Hey everypony! Are you excited to play the game? I sure am! Here are a few quick things to know before you get started. The game will be available to play after our panel at Everfree Northwest (Friday, 6:30 PM PST). There are three ways to get the game. If you happen to be at Everfree Northwest, you can ask any of the Legends of Equestria representatives to copy the game from their flash drives to your computer while you're at the convention. Our servers are now closed! Thanks to everyone who participated! In order to play the game please register on our forums, because your forum account is your game account! You may also want to take a look at our system requirements. Once you have your forum account and computer ready to go, log in with your forum username and password. Once logged in you'll be able to create a pony and explore the magical realm of Equestria! Here are some things you can do in our game! Buttercup and Bluebell the Wearable Items mares are ready to get you all dressed up! Explore the Everfree Forest and go face to face with the Timberwolves! Look out for Zecora's Hut and the Moon Castle Ruins! Visit majestic Canterlot! Have you talked to Astral Charm lately? I hear she's looking for you! Here's a helpful list of commands! /cinemacamera <true/false> Your player will disappear and the camera turns into a camera-fly mode. /time <##> Sets the game time. 0-24. Visit Maplesweet in Ponyville to get the elusive Dandelion Bracelet! 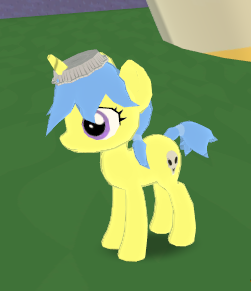 Do the "High Time for Pie Time" quest from Geizhufe in Canterlot to get the fancy pie tin hat!